UFO SIGHTINGS DAILY: Alien Lights Over Orlando, Florida On Jan 1, 2018, UFO Sighting News. 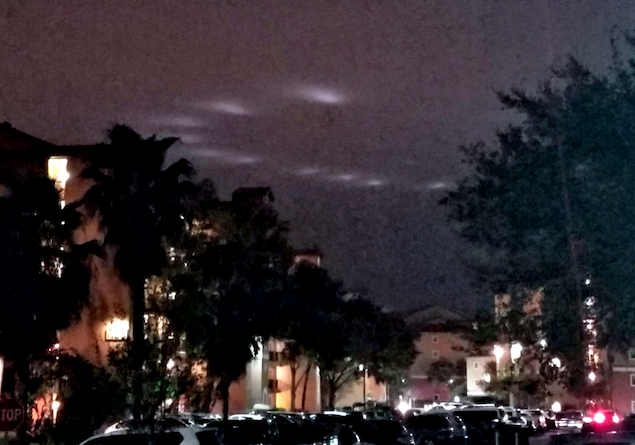 Alien Lights Over Orlando, Florida On Jan 1, 2018, UFO Sighting News. 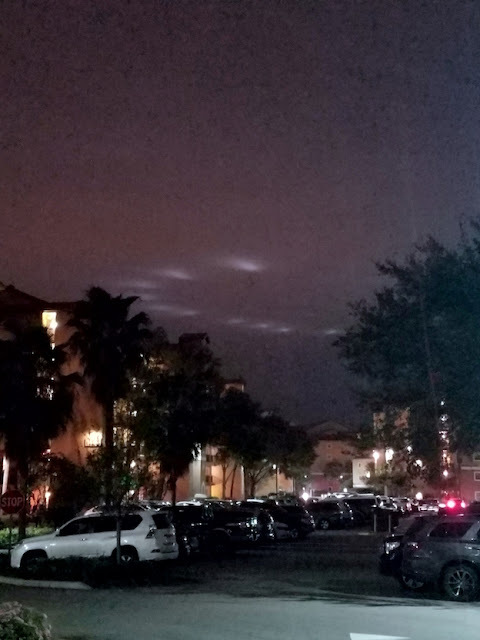 A fleet of white glowing UFOs showed up over Orlando yesterday. The UFOs are reminiscent of the famous Phoenix Lights and in the same positions. The sky is overcast, so the UFOs are deep in the clouds, but still visible. Remarkable photos. Aliens and UFOs like to give signs that they are there. They always know they are being watched, as if they can read your thoughts from miles away...and some will even come back or come closer to observe you. My family and I were at Universal Studios Orlando in Orlando, Florida for the New Year's Eve celebration on 12/31/17 and left the park and got to our car at approximately 12:30am on 1/1/18. We began driving south to our hotel (approximately 4 miles south of the park) via International Drive when we first saw the lights. All 3 individuals in my car witnessed this. None of the 3 individuals had taken any drugs/alcohol/excessive sugar/anything that could affect our vision or judgement. At first, we saw what looked like a very large spotlight in the sky, which wasn't too unusual being that it was New Year's. The spotlight moved very rapidly in a circular motion and split up into various smaller-looking spotlights. They seemed to zoom around erratically for a few seconds, then reformed into the larger spotlight. It then broke up again and zoomed around erratically. It reformed into the larger spotlight then broke up into 10 smaller spotlights and formed a semi-circle in the sky, which then remained stationary. We arrived at our hotel and they were still visible; these smaller spotlights then remained stationary in the sky until at least 2am, when I had to (unfortunately) go to bed. They mostly stayed the same the whole time, the only change I really noticed was that over time the lights somewhat dissipated and became duller, but stayed in the exact same shape the whole time. I will attach two photos I took. I felt incredulous throughout the whole ordeal, and kept thinking, "Is this real life? Are we being attacked in this new year?" I didn't feel threatened though, I almost felt as if they were extraterrestrial, all they wanted was to observe our new year's celebration or something? It was very strange that not too many other cars or people nearby seemed to even look up or care. 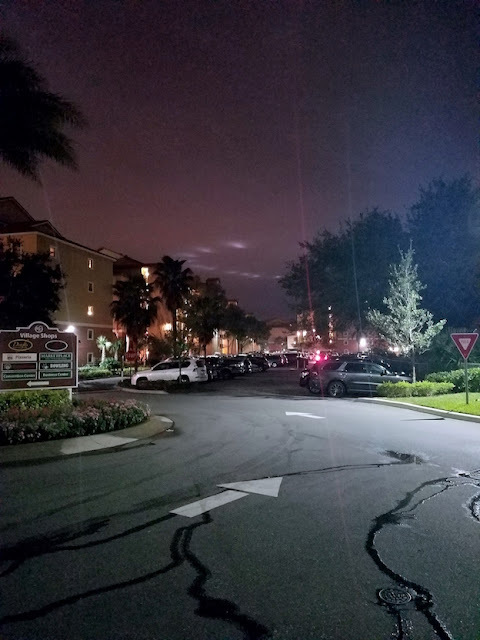 The lights were very apparent in the sky, I just hope that someone else in Orlando saw these same lights.